If you average all the models and take into account the record spring-like temperatures of late we wind up with rain going over to a period of heavy wet snow with accumulations mainly being confined to grassy surfaces. If the European and Canadian models are accurate with colder air rushing in faster and this storm deepening (or slowing down at all)… we have a very interesting forecast on our hands pre-dawn Thursday for portions of our region. Folks from the northern Shenandoah Valley to Baltimore northeastward to Philadelphia, the Jersey Shore and Cape Cod are currently looking at their first major winter storm of the season. 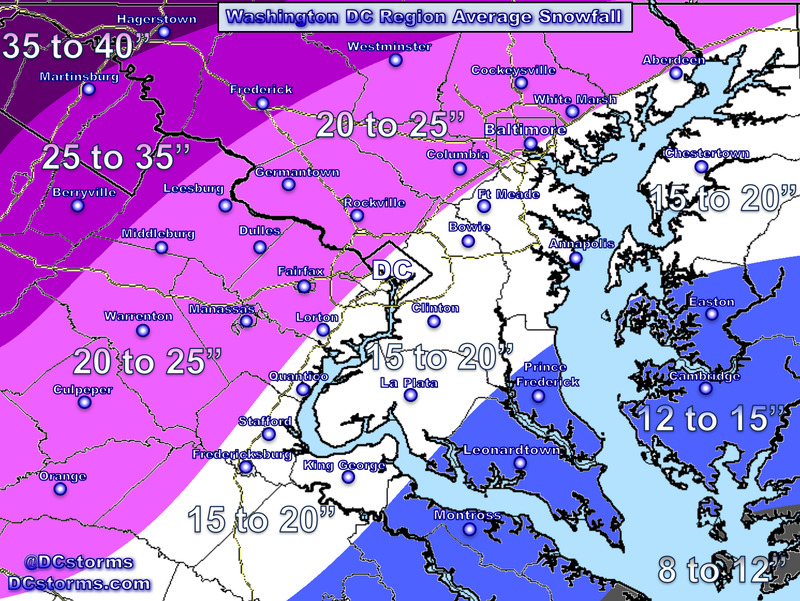 Yes some of the snow will definitely melt as it falls due to the warm conditions but the probability may begin increasing of 4″ or more in these locations and will need to be closely monitored. 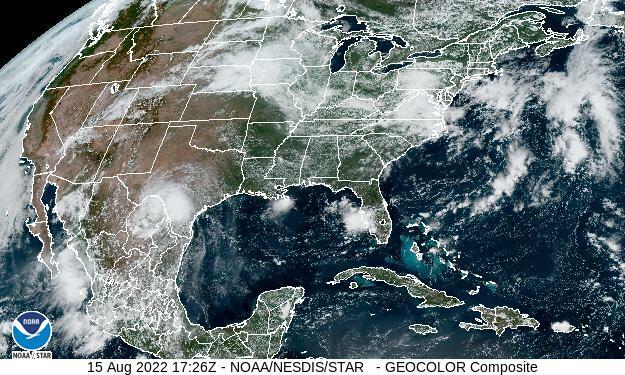 This leaves the Washington Area in the usual conundrum of details that still need to be worked out. You know the saying, “The Devil is always in the Details”. 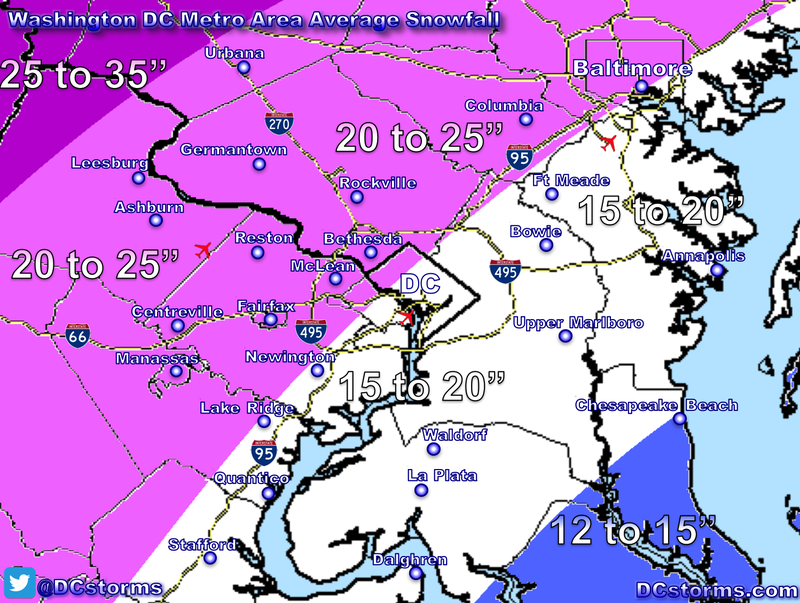 I remember a February storm that rolled through the DC Area dropping over a half-foot of snow after high temperatures were in the mid to upper 60s. There are dynamics in the atmosphere that can produce incredible snowfall rates that overcome antecedent warm conditions wreaking havoc on unsuspecting commuters. Right now, the area that will be most susceptible to potential slush/snow-covered roadways are those of you across northwestern Virginia into the Baltimore Metro Area. 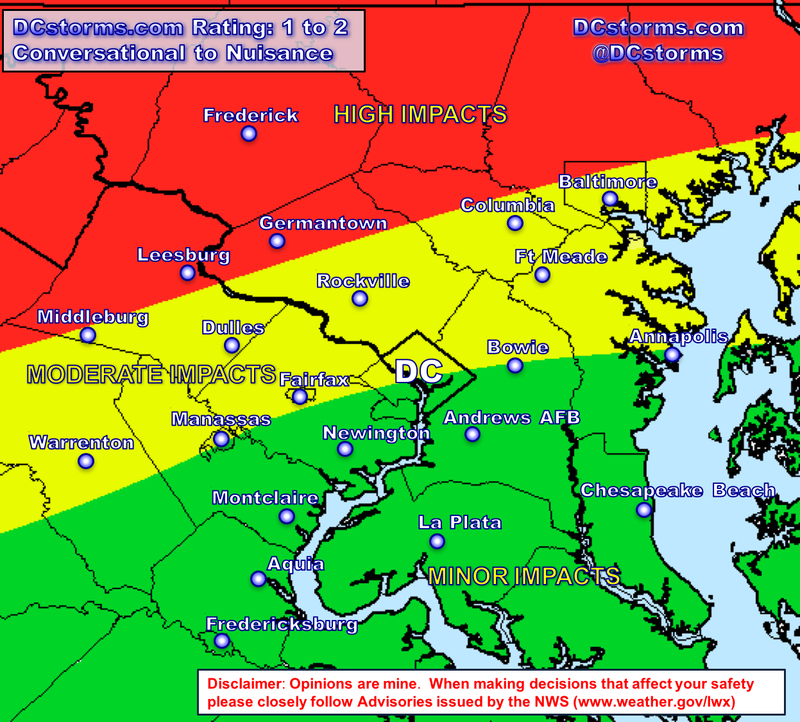 Here is my take on potential impacts during the Thursday morning rush hour (opinions are my own, do not make decisions based on my map that could affect your safety and please closely monitor the National Weather Service (www.weather.gov/lwx) who is the “weather authority” for issuing advisories that may impact life and property. Snow Showers and Snow Squalls are likely Thursday afternoon, some of which could easily drop a quick half-inch to one-inch of snow as the upper-level trough swings through. Temperatures behind this system will plummet into the teens by Friday morning. Wind chills will be hovering in the single digits with winds gusting to 35 mph as the pressure gradient increases behind the departing Nor’easter. For those out there who crucified Mr. Punxsutawney Phil for his forecast of “6 more weeks of Winter”, if he were interviewed I wonder which finger he would be waving to the cameras? On a side note, the long-range models look very interesting between February 15th and President’s Day… Winter ain’t over folks!